I have been working on my skills as a yeast roll maker for the last several months. I have done pretty good as far as taste is concerned but am still disappointed with the outcome. My rolls are not light and fluffy like I want although edible. Any suggestions on what I could be doing wrong to make them not light and fluffy. I find that a second rise is absolutely necessary if you are looking for light and fluffy. I put mine in the fridge and let it slow rise overnight. That hilled slow rise makes all the difference. The only drawback is that you have to plan ahead. If you want rolls for tomorrow night's supper, you have to start your dough today. After you get them into the pan, then you give them another rise in a warm place. Three risings all together. Katie H, we need you and your expertise. Okay so let me get this straight, after mixing everything together, let the dough rise in warm place then overnight in fridge, the again in pan before baking? I do let them rise twice once in bowl for about an hour or so then 30 mins in pan. Thanks for the suggestion. I've made the linked recipe several times and they always come out perfectly, light and fluffy. I don't know if they are exactly what you are looking for, because there are lots of different types of rolls made from yeast dough, but this one definitely works. It's fast with just a 10 minute rest and a 30 minute rise. Thanks Rick I am looking at the recipe and will give it a whirl. The pic looks good, wish mine would come out like that. Yeah. You don't want to rush the risings. 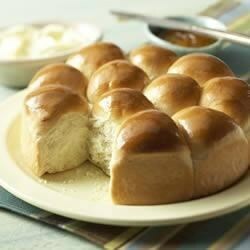 It is the gas inside the dough that is what makes your rolls fluffy. Also, in spite of what others say, DO NOT punch down the dough. Press it gently, folding it into itself. When you punch it down, you lose a lot of that gas and now the dough has to work twice as hard to make more. And sometimes it just doesn't have any strength left. Remember, the yeast is a living organism. Treat it like you would to your child. One more thing. I am not a fan of Rapid Rise Yeast. I think the regular yeast does a far better job and is more active. I use my bread machine to make the dough and for the first rise. Then divide, shape, let rise again, and bake. If you don't have a bread machine, it can all be done by hand, or you can find one inexpensively at a thrift shop. Also, if you don't have one, you can use your microwave as a warming environment: Heat 1 cup water in the microwave on high power, then place the dough in it to rise. Heating the water creates a warm, moist environment perfect for proofing dough. I've never had a problem with rapid rise yeast. 1/2 cup water (80°) plus egg and enough water to equal 3/4 cup plus 3 tbsp. 1. Make sure all ingredients except water are at room temperature. Place whole, uncracked egg in bowl of warm water for 10 minutes to bring to room temperature. After warming egg, remove from shell and place in a 1-cup measuring cup. Add warm water till it measures 3/4 cup, then add 3 tbsp. Pour into the baking pan. 2. Add oil, sugar and salt to the baking pan. Add flour to the pan and smooth into all corners. Lightly tap on the counter to distribute the flour evenly. Sprinkle yeast evenly over the flour. 3. Place the pan in the bread maker; select the DOUGH setting and press START. 4. Check a couple of times during kneading to make sure all flour is incorporated. If not, use a spatula to push flour along the sides into the dough ball. You may need to add 1 or 2 tbsp. water to incorporate all the flour. 5. When the beeper sounds, the dough is finished. Turn the dough out onto a lightly floured surface. Divide into 9 pieces and shape into balls. 6. Place in a buttered baking pan or on a baking sheet; cover and let rise in a warm place for 1 hour or until dough has doubled in size. Bake at 350°F for 20-30 minutes or until done. Note: Mixing, kneading and initial rise take 1 hour and 20 minutes; second rise takes 1 hour.